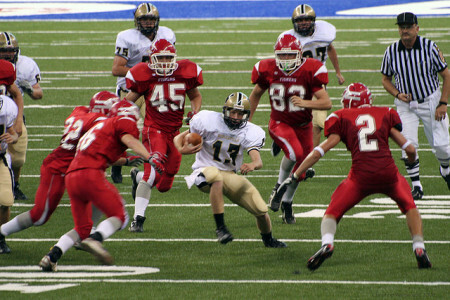 There’s a lot of myths about tackling. But the truth of coaching better tackling is much simpler. I always hear coaches talking about violence. There’s some misguided idea that if you don’t lay the lumber you can’t play defense. In reality, the whole goal of tackling is to get the man with the football on to the ground. He doesn’t need to be hurt. We don’t need cracked ribs, or snot bubbles (yes, a The Program reference). We just need him down on the ground, not gaining any more yards. How do you make that happen? It’s not some special sauce. You don’t need to hire some tackling guru. I do like what I’ve seen of USA Football by the way, I just don’t believe that alone could fix your tackling woes. The key to better tackling is to coach specifically what you want from your kids in a tackle. Build confidence in their own abilities to make a tackle. And then get some help for them. 1 on 1 tackling is always going to be a tough job. The kids who carry the football are usually the best athletes on the field. If they weren’t… well, they’d play more defense. But 3 on 1 is always good odds. By pursuing to the football, defeating blocks, and getting better with our reads and keys, tackling will automatically improve. More guys to the football means more chances to finish the tackle.